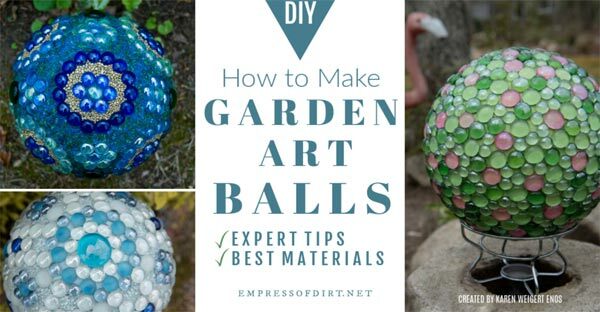 Want to make garden balls? 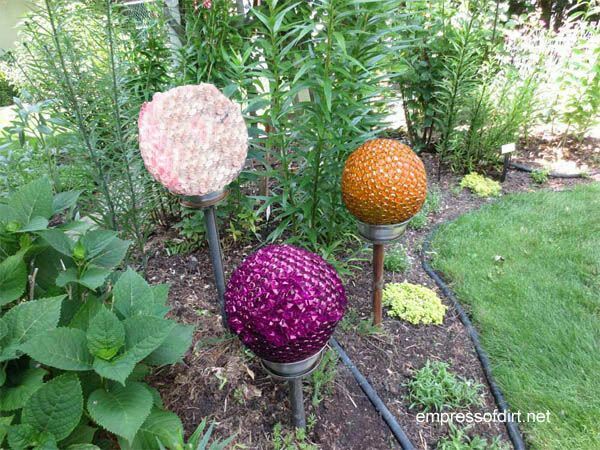 These step-by-step instructions show everything you need to create decorative garden balls. 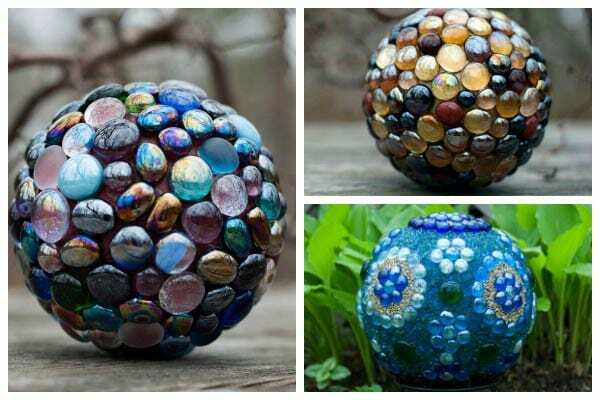 Use a bowling ball or other orb, add some marbles, and design your own outdoor art. 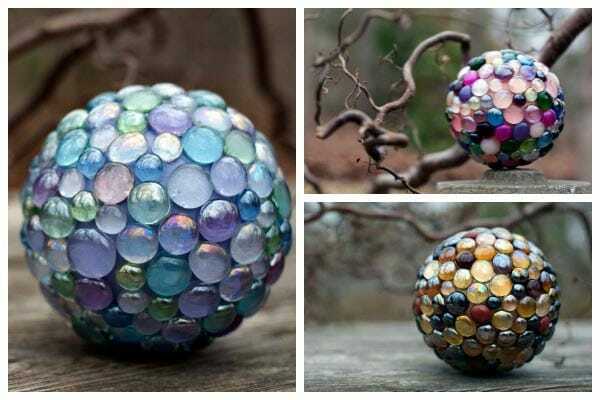 If you’d like some design ideas, I have a gallery of garden art balls here. 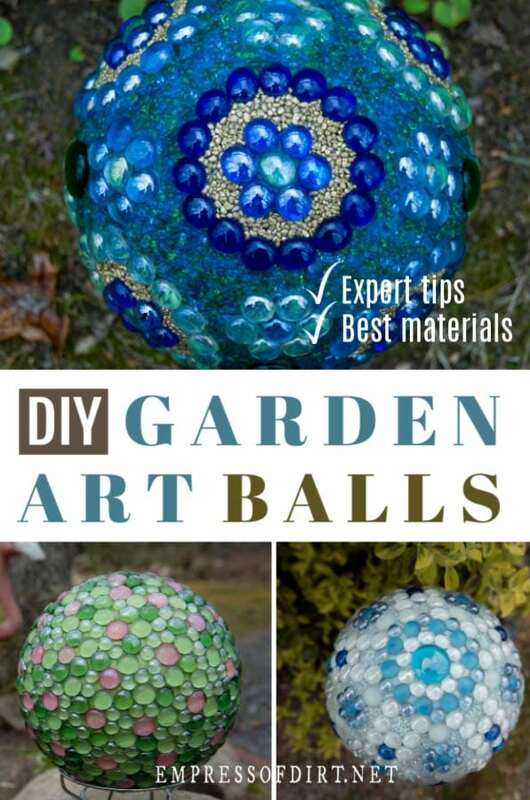 Using a bowling ball or thick glass lamp globe (that’s what I use), some decorations, and adhesive (see the one I recommend here), you can make a glass garden sphere for approximately $5-20. I’ve provided free instructions below. Along with flat marbles (glass gems), additional design options include pennies, old costume jewelry, and/or paint, or decoupage with Mod Podge. Really, you can cover the base sphere in just about anything with a flat side that adheres nicely and can withstand the weather. I often get asked about grout after the basic ball is completed. No, you cannot grout the balls with this method. 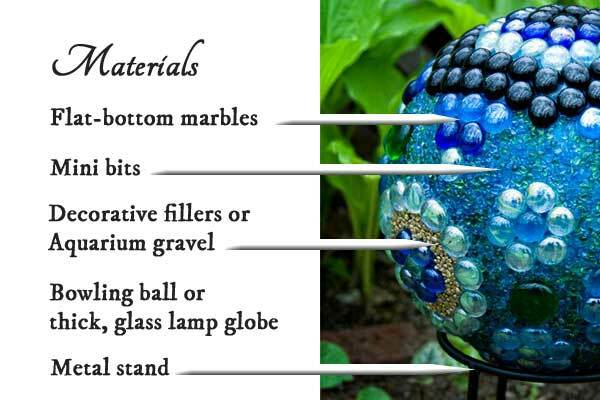 If you want to cover up the areas between the marbles (as shown in the photo below), use mini bits, which are listed in the Garden Art Balls Materials section (below). Here are ideas for the base, decorative materials, and adhesive. Lamp globe. I look for old lamp globes (from ceiling fixtures) at the thrift store that have strong, thick glass. I have lamp globes in my garden all year-round here in Canada and I am yet to have one break. The old ones are tough! Bowling ball. Be sure to sand off the glossy surface before you start for better adhesion. Some people also use old sports balls such as a soccer or football ball but I have not tried this myself. No matter what, do a test to see how your materials stick. You may need to sand after spray painting as well. Spray Paint. 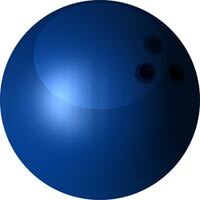 If you want your bowling ball or lamp globe to have a colour that shows in the gaps between the marbles, sand and spray paint it first. Krylon brand works nicely and comes in many colours. The quantities needed will depend on the size of your base (lamp globe or bowling ball) and how complex your design is. Flat Marbles – flat-bottom marbles, round marbles (glass gems), square gems. This may be the only decorative item you need. If you want to make a complex design, consider the following items as well. These fillers (for the gaps between the flat-marbles) are sold under various names. It really helps to see them in-person or read the size descriptions carefully online. You want to be sure they are the size, colours, and textures you want for your project. I have found them in craft store, florist shops, and dollar stores. Most often they are in the floral department. Coins, round glass or mosaic pieces, flat stones or decorative accent glass, beads, necklaces, aquarium gravel…. Quantity will depend on the size of your ball or globe. Leftovers can always be used for other projects. Outdoor silicone sealant/adhesive. I use clear (not white or any other colour) GE Silicone II and it must be waterproof and made for outdoor use. 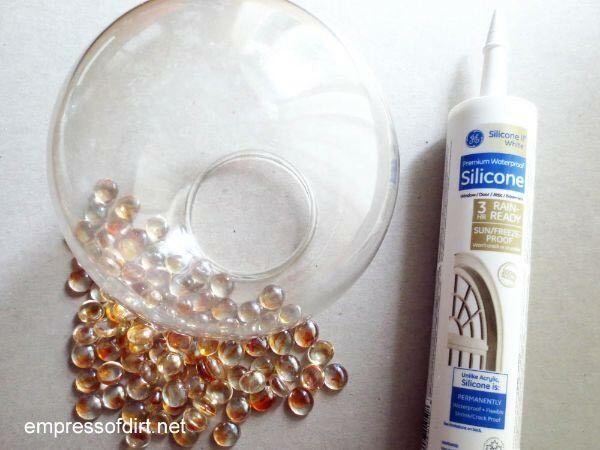 GE Silicone II sealant is sold as a sealant but works as an adhesive when you apply it fairly thickly, allowing it to grab the flat marbles as it sets. Do not substitute with other sealant products – GE Silicone II is the only one I’ve tested that works. Check the ‘USE BY’ date on the tube to make sure you’re getting fresh product. 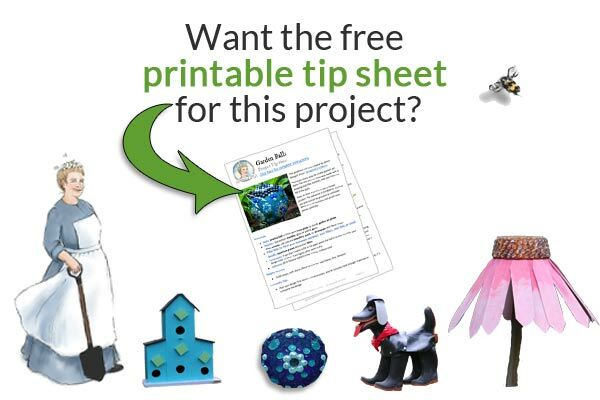 Also see The Glue Resource Guide for Garden Art Projects for more options. Caulking gun (if you’re using a tube cartridge). Don’t worry: they’re inexpensive and they’re not guns. They simply dispense the silicone sealant. Phew. GE Silicone II works very nicely as an adhesive for outdoor garden art projects because it is permanent. This means you cannot remove it once it has dried. This is why I recommend you plan your project design in advance, make sure you have enough materials, and work in small sections, applying just enough adhesive to secure a handful of flat-marbles before continuing with the next section. If you have to stop in the middle of your project, use up any adhesive you have already applied first. You cannot add more adhesive on top of dried adhesive. It will not stick. 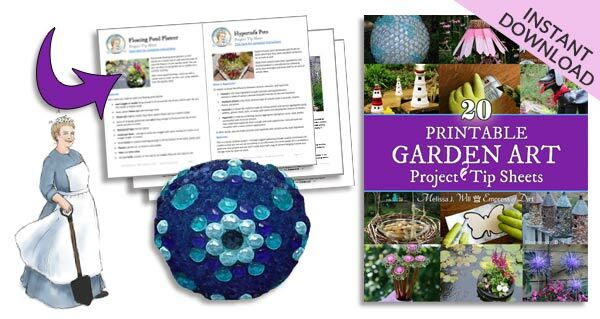 If you are new to using this product, this answers frequently asked questions and provides tips for successful use for outdoor garden art projects. Read all the steps before you start. This tutorial a basic ball with flat-marbles. Using fillers or ‘mini bits’ is a more advanced method that requires a lot of time and patience, applying each tiny bit, one at a time, while the adhesive is still wet. If you are keen to try this, be sure you read and obey the adhesive product warnings regarding ventilation and skin contact. You must read and obey the warnings on the adhesive product label. The adhesive works so well because it forms a permanent bond. This also means, you only have a limited amount of time to add your decorative materials before it dries. Once it is dry, it is never coming off and there is not anything that will remove it. This is why I advise you to plan your project ahead, and work in small sections. Assemble your materials including glass lamp globe or bowling ball, flat marbles, floral fillers, and GE Silicone II. Read the product label to understand health and safety considerations, clean up, and drying times. If you are new to using silicone sealant as an adhesive, read these tips for success first. 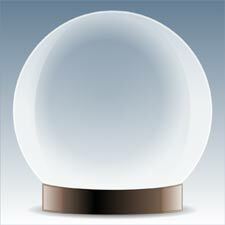 Start with clean, dry glass lamp globe (the old kind with thick glass) or a bowling ball. For best adhesion, rough up the surface of the bowling ball with sandpaper. You can also apply spray paint if you want a specific base colour. If the spray paint creates a really smooth surface, rough it up (gently) with fine-grit sandpaper. You must be certain the surface you apply the adhesive to has some ‘grab’ and is grease-free or the adhesive and marbles may not stick. Make sure you are using the correct adhesive. Other sealants I’ve tested do not work the same way. 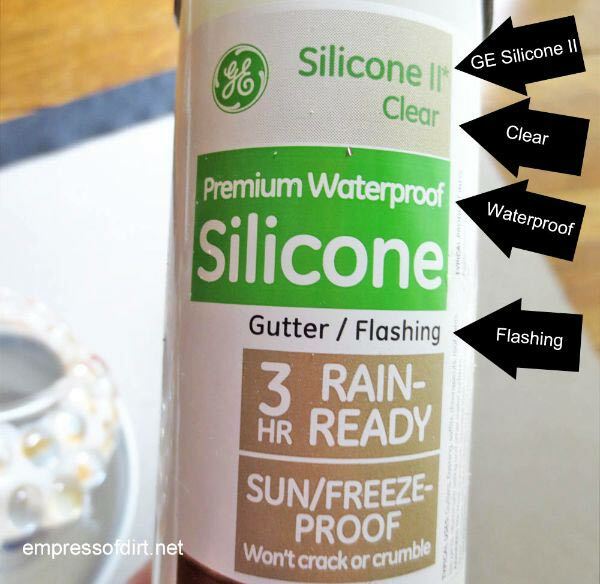 I recommend GE Silicone Sealant: waterproof, clear-drying, for outdoor use. Please read the product label and follow the safety instructions. Plan your design first, work in small sections, and be sure you have enough materials to complete the design. 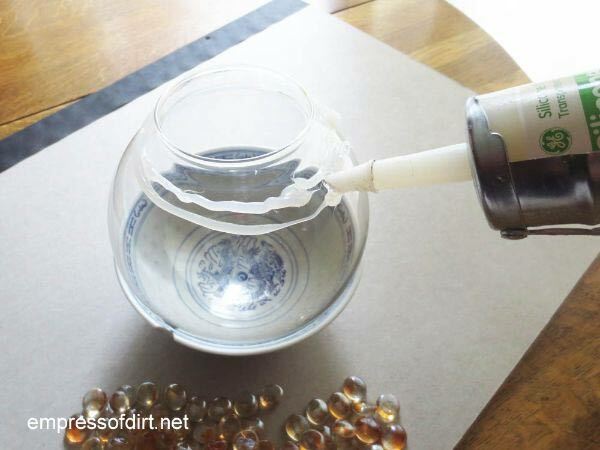 Use a strong bowl to hold the glass globe or bowling ball in place while you’re applying the silicone sealant. Work in small sections. You want the sealant at least 1/4″ thick. Again, read the label on the silicone sealant and follow the safety guidelines. It will also tell you how long the adhesive will take to dry. If you want to add decorative fillers, this must be done while the adhesive is still wet. Once the silicone sealant dries, it cannot be removed and will not stick to anything. Press each marble snugly into the silicone and let the silicone ooze out around it. This will hold the marbles in place as the silicone dries. Do not get the adhesive on your skin. If your marbles are not sticking, stop what you are doing. This probably means the surface is not clean enough or has some sort of greasy residue that the adhesive cannot stick to. Or, the adhesive may be old and faulty. Either way, remove all adhesive immediately with a rag, before it dries, and see this page for troubleshooting the problem. 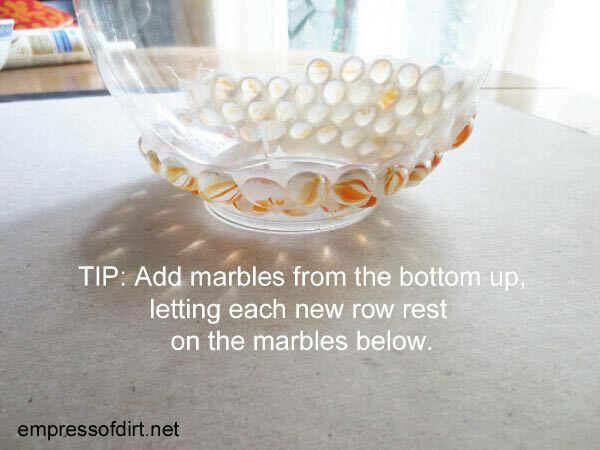 If you work from the bottom up, each new row of marbles rests on the row below and they won’t shift around while you are waiting for the adhesive to dry. If you’ve applied at least a 1/4″ of silicone, and let the marbles touch each other, they should stay firmly in place. Need a Break? 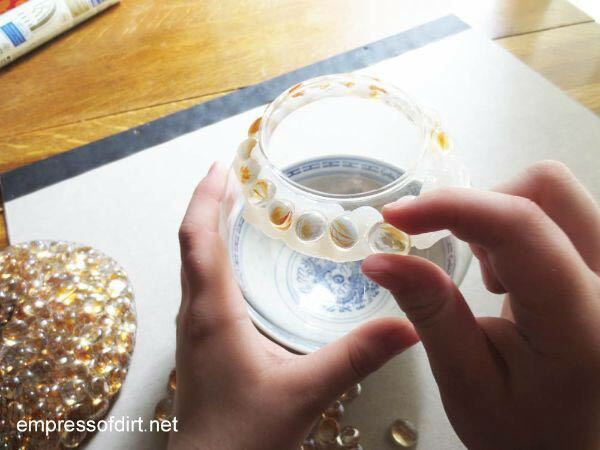 If you do not want to complete the entire project in one sitting, just make sure you have applied marbles to any section with adhesive before taking a break. Again, you cannot make the adhesive sticky again once it has dried. There are no second chances with this stuff. But it’s worth it because it works so well. When you have finished adding all the marbles, allow everything to dry. See the product label for the required drying time. When the silicone has dried, your globe is ready to be displayed outdoors. Have a look at your local thrift shop. I often see weird nameless things that would make great stands. Bird bath or flower pot, or on the ground. 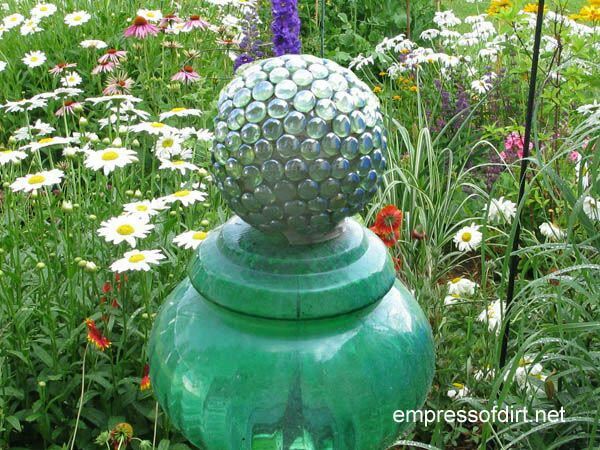 I used an old glass lamp as the base for this garden art ball (above) and solar lamp stands for the ones below. Here’s a few more by Karen Weigert Enos. You can see more about Karen and her art here. I hope you’ll make something wonderful. I got busy yesterday and forgot to let you know how much i enjoyed that garden tour,she was very talented. Did u put something else on the ball after the silicone dried? Hi Cathy, No, nothing else is added. I am wondering how to keep the glass gems from fading. I don’t think they do fade. Or I’ve never of this. Some of my projects have been outdoors for years and the colour remains the same. I’ve already PINNED this post – what wonderful – and fun – ideas!! Silicone should keep in hot weather – we have a craft product here called gel medium, which I used to make mock cracks on a pot that broke and on the sections that were glued together – simply painted over with craft paint – two years on and it is still holding. I remove silicone with acetone (or nail varnish remover), whether to clean the hands or surface you are working on, but it needs a bit of soaking when cleaning off old silicone. Never use a plastic container to work in though – some plastics are not resistant to the acetone and will be dissolved. I loved your blog – I am always making odd ornaments with found stuff. Might make up a ball with some shells I received from someone last month. Should be something different. Due to the heat wave we have been having in RSA, our gardens are sere and brown, so these balls will provide welcome colour. Regards! There is silicone sealant all over the globe including the gaps where grout would be. I have not seen mildew accumulate on silicone sealant. I have tried and failed this using bowling balls. I believe the sun heats up the ball and releases the oil that has built up in the ball and the glass discs start falling off along with the sealant… have not found solution to this problem yet! With the info you provided, my guess is that the sealant you used was not fresh and perhaps was outdated. It will separate and not grip well when it’s old. Check the tube for the date before purchasing. Also, if there is any grime on the surface of the ball, you can remove it with methyl hydrate (available where paint is sold). This removes any trace of oil or grease. Also, try sanding the surface of the bowling ball to rough it up and ensure better grip. Some people also mention that glass gems sometimes seem to have a filmy residue on them. Be sure they are clean and grease-free before applying. Oil is used to condition bowling lanes. A ball can absorb the oil after some time. It may not be visible on the surface but when it heats up, it may start seeping. As a bowler, I bake the ball on a low temp for awhile to draw the oil out from the core. It then performs better. I am wondering if the same oil seepage is occurring to your project? I would recommend baking it for a few hours, then wipe it off and try the adhesive. The new balls are more porous than the old plastic balls. It may serve you better to buy an old ball from a garage sale. I love this project. I have been wanting to make one for a long time after my rambunctious boys broke the one that I had that had belonged to my Mom. Great instructions! I am definitely making one or three. I love this tutorial! Thank you for such good, clear instructions and photos! I was wondering if you think it would be possible for me to do the same process on a rock? I have a few medium to large rocks in my flower bed that I think I could bling them up… What do you think? I’ve certainly seen rocks used this way but have not tried it myself so I’m not sure how long-lasting the bonds would be. Could be fine—I just don’t know. If you try it, I’d love to hear how it turns out. Do you have any recommendations as to how to seal off the end of the silicone tube inbetween sessions that you would be using it? Can you just leave it and then puncture through the film that I assume will form? Working on my first globe and with silicone for the first time. Thank you for the fun ideas! Hi Pat, Many of the tubes come with caps that work pretty well. If I lose the cap, I insert a nail that fits snugly. Have fun with your globe! After my dog smashed my gazing ball with his tail, I decided to use my dad’s bowling ball, since he had passed away, I liked the idea I could keep a memory of him in my garden. Wish I would have see this before I made mine. I used a waterproof glue that was recommended from a craft store and craft gems. After 6 months, either the glue or the backing on the gems discolored, terribly! I spent a lot of time creating this and wanted to keep it, so covered it with a mirror-spray paint. It works, but after seeing your instructions, I may glue over it (something more colorful & happy) Thanks for the great idea. Hi Susana, I would strongly suggest you make one ahead of time. The amount of adhesive needed depends on so many variables including the size of the globe, the weight of the flat marbles, how closely they are placed, and the individual applying it. Once you’ve made one, you’ll have a very good idea of how much it should cost for your group. Would styrofoam balls be ok to use? Glass balls are so expensive in North Bay ON. I have not been able to find any glass balls at thrift stores. Where do you get the Lamp Globe? Hi Keelyn, I get the lamp globes at thrift shops. Hi, I am anxious to start my bowling balls but have no idea what or how to fill the holes drilled for the fingers. Please let me know how or what I am to use. Love your blog! I just leave the holes as-is and designate that part of the ball as the bottom. When I make my bowling ball project I start at the top end of the ball from the finger holes. I start placing my gems, pennies or whatever you might want to use, working my way down. I put several on the ball at a time, then let it dry a little before adding more. when I get to the finger holes, I use a little of the GE Sealant inside the holes and add small objects such as smaller glass gems that are scratched or deformed to fill these holes. when I get to the top of these holes I add more of the sealant at the top and then placing a gem, penny or whatever into the sealant so that it covers the holes up, making my ball totally covered. I sometimes just fill the smaller holes and leave the bigger thumb hole open so if I want to place it on a metal rod in my garden. ( you must hammer the rod a foot or two in the ground for it to support a bowling ball (gazing ball). I hope this helps. I’m adapting this idea to rocks since I don’t have a bowling ball or glass globe on hand. I wanted to get rid of some clear, half marbles I had on hand and attached them to the rock with silicone, I placed the decorated rock in a sunny garden but now I’m wondering if the sun will heat up the clear half marbles and cause the silicone to catch fire (like a magnifying glass)? My altitude is 4,000 feet and the summer temps can be in the 90’s-100’s. Any thoughts? Cindy, I think you may want to read the silicone sealant label thoroughly and look up any further info you need online (at the manufacturer’s site). The stuff I use is not flammable and is tested to stay in place up to 450F. In other words, I have no concerns about it in the examples you provided but you should check for yourself with the exact product you are using. I also have a question regarding glass totems. I have a problem with them collecting humidity inside of them. What am I doing wrong? I have not had that problem. All I can guess is perhaps it’s not a complete seal at the joins and moisture is getting in.